I created this dark and smokey eye shadow look with the MAC Evil Eye:Eye Shadow x4. 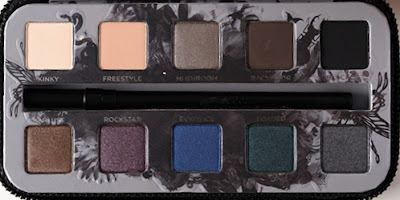 This palette is no longer available plus, i no longer recommend MAC products due to the fact that they have been placed on the companies that test on animals lists. A deep berry, a blackened violet, black and light gray shadows were the color used for this smokey eye. I recommend Urban Decay Naked Smoky Eyeshadow Palette and/or the Urban Decay Smoked Palette to get this dark and mysterious purple smoky eye. Both palettes have great purplish gray shades to get the perfect smoky look.